Goalkeeper Chris joined the Hornets in 1997 in the deal which took fellow goalkeeper Kevin Miller to Crystal Palace. He played just 11 games in four seasons at the club, including the famous 1-0 victory at Anfield. Still playing at Stevenage, Chris spoke to Watford Legends in 2011. Hi Chris, thanks for talking to Watford Legends. You were at Crystal Palace and transferred to Watford in 1997. How did the move come about? I had had a really good start at Palace who I had joined from Spurs when I was 20. I lost my place in the side just after Christmas, around February I think, and I didn’t play again for the rest of the season. My agent heard about the rumour of Kevin Miller joining Palace, and he managed to get me incorporated in to that deal. I felt I could go somewhere where I would be wanted and be part of a squad. To join Watford also appealed to me as they have a good history. GT had just gone back and I wanted to be part of the plan to get the club getting back to going onwards and upwards. Did you settle well in to the club? Yes, I was local anyway, but at the time I lived in Crawley when I played for Palace, and I moved to Stevenage at a time when the housing market was absolutely buoyant, so moving house was no problem at all. So there was no hassle in moving. At the time Rob Page was living in Hatfield and we used to meet up and travel together for training at Stanmore. What do you recall of your debut? I remember that I joined the club and had a good pre season, but come the first game of the year I had an abscess in my jaw that I got when on the pre season tour of Finland. So I was unavailable for selection. I don’t know if I would have been selected, but I like to have hoped that I would have been picked. Alec went in goal and I suppose you could say that the rest is history. I remember about a month of six weeks in the gaffer said on the Tuesday afternoon he wanted me to get my debut under my belt and that I would start away to Sheffield United. I can still remember now Brian Deane bundling in to the back of me and the referee not giving me the free kick. I was grateful to make my debut, but it was on an off-night for the team. The referee, Mr Singh, has refereed me since and I have bantered with him, and he has since conceded it was a free kick! You were part of GT’s second coming when he took the club to the Premier League in two consecutive jumps. How did you enjoy that time? It was a great journey. There were some fantastic people at the club from supporters to staff, and we had a great group of lads in the squad too. I feel quite fortunate in my career that I played for Tottenham, the team I support, Watford, great club to play for and QPR. At Watford in particular, due to the way they work in the community, even if you were not in the side you were made to feel a big part of what was going on. You were at the club for four years, but made only 11 starts. If you could rewind the clock, would you have still done that or would you have preferred to play elsewhere and get the games? Let’s put it this way, the FA Cup third round draw has come up and we (Stevenage) have drawn Liverpool. And the lads are bantering with me for the fact that I have ‘been there, done that’. It’s tongue in cheek of course. 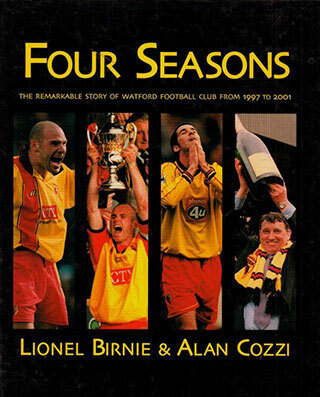 But there are memories I have from Watford that I wouldn’t change. Alec at the time was 34 years old and he probably had the best spell of his career at that age. I learnt an awful lot from Alec during my time at Watford, and I feel that I am reaping the rewards of that now that I am getting older. I will be 37 at the end of the season, and Alec was still playing at a high level at 39. So I hope that what I learned from him then is benefitting me now. I believe it is a skill to cope with not being in the team, and I believe I am getting my pay back for that now. Also, from being at Watford when Kenny Jackett was there, he knew the sort of bloke I was and that helped me to get a contract with QPR. Talking of the Liverpool game, not many teams go to Anfield and get a one-nil away win. Yes we went up to Liverpool thinking that it was going to be a tough day for everyone concerned with the club, but we scored at a good time and we rode our luck a little bit to get the win. We were up against a Liverpool side that were in transition. They had a young Steven Gerrard in the side, and then some older heads with the likes of Hyypia. We rode the storm as the game went on and could have made it two nil at one point. The abiding memory though was of Liverpool getting booed off the pitch by the Kop and then giving us a standing ovation and clapping us off. That was amazing. You then joined QPR. Why was the time then right to leave Watford? I remember at the end of the season I got a little run in the side and we didn’t get bad results, and from the seven games I played we got 12 points. So my games to points ratio was quite good. I sat down with GT and signed an extension, but then Espen Baardsen joined the side and I ended up going to Lincoln City for three months to get some games. So I knew it was time to move on, no grudges. QPR had just gone down and it was a move where I didn’t have to move house. A few of us went down there. Steve Palmer went there to captain the club, and Alex Bonnot and Richard Johnson also went there. So I think we helped each other to steady ourselves. I played not far of 100 games in four years there, and that included 18 months sidelined when I broke my leg. When I was injured I decided to buy in to supporting the club. So instead of sitting with the other players on match day in the stand with a club tie on, I went with my wife in the stands properly and decided to follow QPR home and away. When I did get back in the team the fans gave me a great reception. You have moved around the clubs a bit but also have made quite sharp jumps in terms of the level you are playing at. For example, you have played for Watford, Lincoln, QPR and Aylesbury. Is it sometimes a question of getting games? With Aylesbury I was in the really early stages of rehab following the leg break, and I could barely kick a ball. But it was good to go there to get some confidence back and take a whack on my leg to put it to the test. With Lincoln it was just a case of getting some games. So going to those lower clubs can be a useful thing, and also you can help some aspiring players by showing them the level of professionalism and dedication it takes to be playing at the higher level. You are now with Stevenage. What are the plans? We’ve won the FA Trophy and been promoted twice in the last three seasons. And I have lived here since 1996, so it’s very much my home town now, even though I am from East London. I probably know two thirds of the lads who are stood on the terraces. We are looking at kicking on this season. I am enjoying being part of everything at Stevenage. I have been walking round Asda this afternoon doing my shopping, and it is nice to talk to people knowing I have been a part of turning Stevenage from a non-league club to a League One side. As for me, I am planning on playing as long as I can and enjoying it. Well thanks for your time Chris, all the best.